No, it’s not quite Lent yet. But notice that word “holy” in the title of today’s blog post. 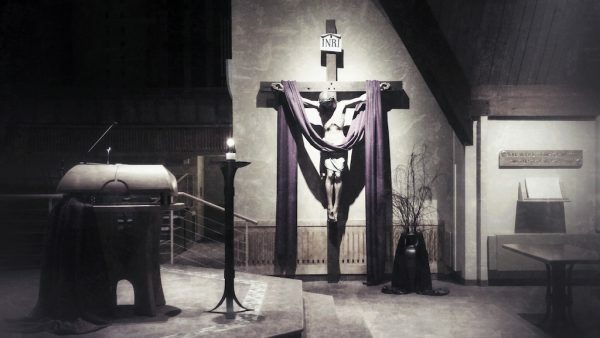 Lent will be here whether we prepare or not. If you desire a holy Lent, however, a little planning is essential. Let’s get going! Find a prayer partner. For where two or three are gathered together in my name, there am I in the midst of them. (Mt. 18:20) Not only is it good to pray with another, it can help us stay on the right path, holding us accountable. If you’d like to have a good and holy Lent, one way to do that is to find a friend or family member to be a prayer partner. Get together now, before Lent even begins, and work out what you’d like to do: pray together once a day, study and pray over Scripture, etc. Get involved in a parish Lenten group. Many parishes offer special Lenten group programs, such as Living the Eucharist. This is a great way to focus our Lenten efforts, with the added bonus of getting to know our fellow parishioners better. Focus on just one part of Scripture. Lent is not the time to plan to read the entire Bible. That is an admirable goal, but it’s too easy to get excited, fly through Genesis and Exodus, slow down in Leviticus, and then get completely bogged down in Numbers. Instead, focus on just one book of the Bible, or perhaps on just one section of one book. This might be just the thing to kick off a serious practice of lectio divina. Plan your fast. Yes, fasting is a wonderful Christian practice, and one we are urged to practice during Lent. However, if you’ve always given up chocolate for Lent, now might be a good time to plan something different. First, why does the Church encourage fasting? Then ask, “God, how are you calling me to fast this Lent?” Consider that you may be called to fast from complaining during Lent or that God may be calling you to fast from social media. Give God a chance to speak to you. Get and keep a prayer journal. Many of us benefit from the simple act of writing out our thoughts in a journal. In this same spirit, keeping a prayer journal can be edifying. It need not be fancy, expensive or complex. Buy a simple notebook and record your prayers, and how you believe God is working as you pray. If you need a bit of guidance or a jump start, check out these resources. It’s not Lent, yet. But it’s less than a month away. Spend a little time preparing, and ask God to help you plan for a truly holy and rewarding Lenten season. Then we shall see, in our own souls, how the desert can blossom, and the dry and wasted land can bring forth the rich, useful fruit that was expected of it from the beginning.